New book is about someone who went through abuse from childhood to adulthood. Author Isabella Rayna’s own daughter suggested to her mother that she should write a book. This suggestion prompted Rayna in writing “Someone Left Behind,” (published by AuthorHouse) a true life story about someone who went through abuse starting at a young age through adulthood. At the age of two, Lily lost her mother due to an unknown illness. Soon after her father left, leaving Lily behind in the care of her 17-year-old sister, Patricia, who vowed to keep a promise. However, Lily lived on the fringes of society in fear, poverty and abuse. At the age of 16, Patricia threw her out of her home, leaving her homeless. As she boarded a bus to an unknown future, the thought of leaving her school, hometown, friends, her nephew and nieces and especially the love of her life was beyond what she could handle. During her preschool and teen years, she suffered the brutality of Patricia’s boyfriends. Lily lived most of her life as an introvert due to low self-esteem. But the desire to succeed in life gave her the strength to withstand and fight her social phobias. 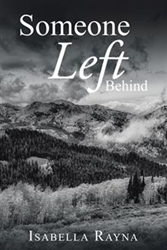 “Someone Left Behind” is an emotional, wrenching, unforgettable true life story, Rayna hopes that after reading this book, readers will realize the emotional trauma that children suffer at the hands of an abuser and how they can still overcome everything to make a new life for themselves. Isabella Rayna is a resident of Florida. She has a degree in Early Childhood Education. She spent most of her life educating pre-kindergarten children and preparing them for the public school. During her spare time, she takes out her canvas and brings images to life with oils and acrylics. Some paintings have been displayed in the gallery and some have been sold.